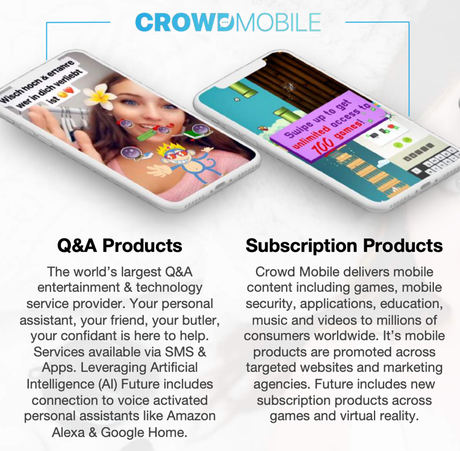 Dual ASX and Frankfurt-listed global mobile entertainment and digital media company, Crowd Mobile (ASX:CM8 | FWB:CM3), has identified an opportunity to transition into the fast-growing global business of monetising social media. Recognising the chance to capitalise on the rise in social media use, and social media influencer marketing in particular, the company is shifting from its past product-centric position into a platform company that markets through technology — predominantly to millennials. To reflect its new direction, Crowd Mobile will change its name to Crowd Media Holdings Ltd at the 2018 AGM today. Utilising its proprietary technology platforms and experienced team, CM8 offers brand clients the chance to reach millions of social media users. It creates digital platforms, builds mobile products, and works with digital influencers across social media channels. Considering that the total number of global social media platform users are forecasted to grow from 2.46 billion in 2017 to 3.02 billion in 2021, this seems to be smart move. 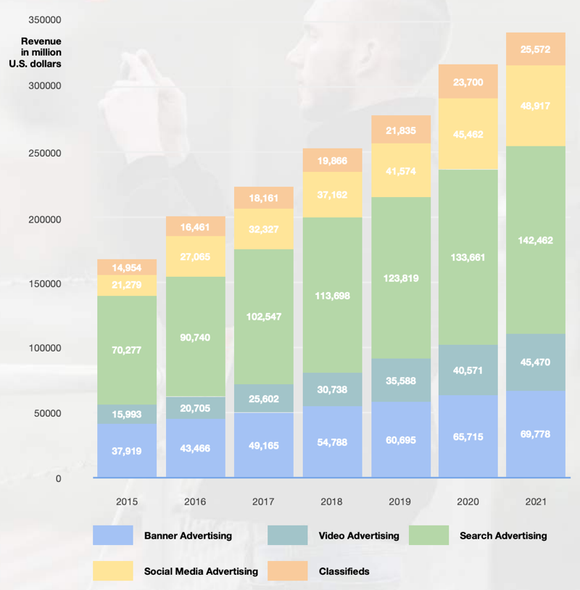 Along with the number of social media users, digital advertising revenue is forecast to grow through 2021, too (as shown below). Note the particularly sharp growth in forecast social media advertising. The global and generational shift to social media influencer-driven content is hugely impacting the way brands reach young consumers. Millennials fixated on Instagram, Facebook, Snapchat and YouTube, aren't interested in or aware of old media channels or brands. CM8’s business is split in two divisions — the existing CrowdMobile division, which comprises the Q&A products and CM8’s subscription products, as well as the newer CrowdMedia division with its Influencer Agency and Affiliate Agency, as outlined below. The 2019 financial year is a year of transition for CM8 to diversify from its mature Mobile division to focus on its faster growing Media division. The Media division is focused on the digital influencers industry, and this is where CM8 plans to concentrate most of its attention, moving forward. 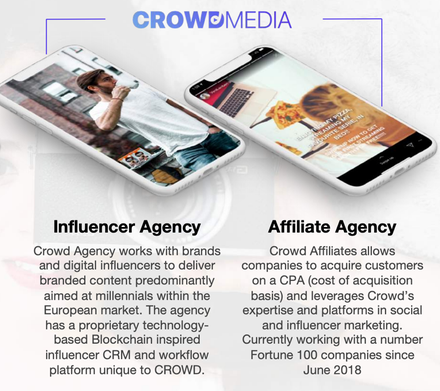 This includes Crowd.Agency, a digital influencer marketing agency, and Crowd Affiliates, which helps Fortune 500 companies acquire new customers. 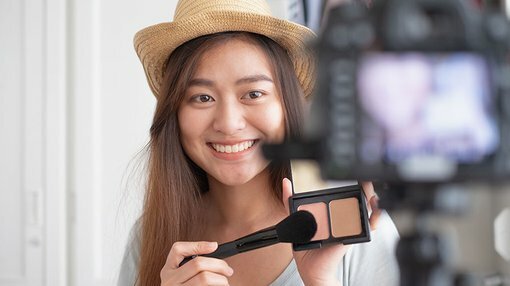 It works with brands, digital influencers and affiliates, while continuing to attract blue-chip partners, which include the likes of L’Oréal, Nestlé and Snap Inc. The Media division is already demonstrating strong growth momentum, with more repeat business from global clients and robust pipeline. First half 2019 revenues are forecast to be 250% higher than total revenues for the entire previous financial year. While the Affiliate business is already profitable, the Agency business is expected to break even by the fourth quarter of the 2019 financial year. During this transition, the Mobile businesses will continue to generate stable revenues and remain profitable to fund growth in the social media businesses. CM8’s Mobile division is maturing so revenue growth is limited there. Combined with the opportunities in social media marketing, this has led to the company’s decision to focus on revenue growth in Media. Across the sector, subscription business revenues have fallen sharply, as the telco industry reshapes — however, proactive cost-cutting in this division has helped CM8, as has improving margins with new technology such as AI (artificial intelligence). The company secured a significant milestone last month when it inked a partnership with US$8.7 billion social media giant, Snap Inc. (NYSE:SNAP), to assist in creating unique brand experiences. This is huge step for CM8 as Snap Inc.’s global multimedia messaging app, Snapchat, has approximately 188 million daily users. The deal positions CM8 as of one of only six global Snap Certified Partners, providing access to leverage the Snap Inc. platform across e-commerce, direct response and data-driven advertising for its own products and clients. CM8 will gain better access to Snap’s technology and limited beta test programs, as well as validation to external brands and clients of CM8 being as a leading performance marketing partner. While the partnership announcement is significant, CM8 has already been working closely with Snap for several years for its own Q&A division products, using Snap for external clients, including large Fortune 100 companies.